We know that, there will be so many special occasions in our life. Graduation ceremony is no doubt one event that we should treat seriously, as it marks the start of a new chapter while celebrating the achievements that led to that point. Not only will you be in front of hundreds of classmates, family, friends, and faculty, but you will be snapped in countless pictures that will be looked back on for years to come. That being said, it is extremely important to look your best so that you make a good impression and don't have any regrets in the future. Check out some of our tips of what to wear on your graduation day below! To make your graduation party perfect and no regrets, graduation dress is a basic equipment. Don't reach for the trendiest, tightest dress in your closet. Instead, opt for a cute and conservative style that will look appropriate in front of friends and family alike. Since graduation is in the spring, I would recommend choosing a sleeveless style—especially since those robes can get a little toasty. This little number from eDressit 2018 new collection is an adorable option. I wouldn't say that your jewelry has to be simple to the extreme, but you also don’t want to overdo it. Stick to one staple bauble—whether that means rocking a statement necklace or having an arm party. Then keep the rest of your jewelry simple—a ladylike ring, pearl earrings. Try to avoid anything that jingles around as you will probably be shaking hands, waving, and giving hugs all day. This lovely pink statement necklace from Bauble Bar would be perfect with a high-neckline dress. I hope these tips have helped to prepare you for graduation day! As long as you dress to flatter your figure and channel your true personal style, I'm sure you will look greater even than them. 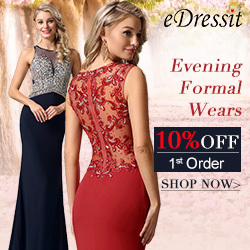 All these looks and dresses can be found in eDressit style gallery. Love your photos! Take a look at my blog post about what to wear to a college graduation, hope you'll like it!